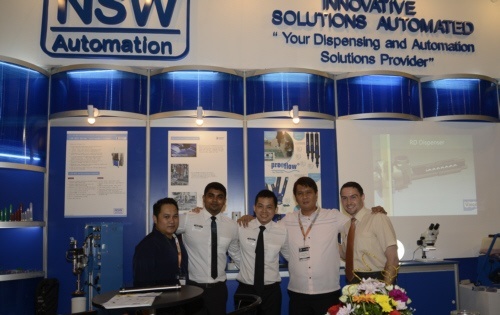 The PSECE, one of the world’s largest electronic trade shows, was held from June 4th to 6th, 2014, in Manila. In these surroundings, ViscoTec presented itself and the trade mark preeflow as a manufacturer of dosing and micro dispensing systems, which have proven to be successful in various manufacturing scenarios for the electronic industry. High-precision dosing pumps for 1- and 2-components are being used in these processes. Due to its special technology (endless piston principle) ViscoTec systems are particularly suitable for pumping and dosing of mid- to high viscosity; filled, abrasive and/or shear sensitive materials. With high-precision systems that can easily be integrated into various system concepts, ViscoTec offers its customers process safety, efficiency improvement and cost reduction. This high quality standard of ViscoTec products meets the requirements of the electronic industry, which is reflected in the huge market success of ViscoTec in this growing market.